It is our main task to teach, and give all children the best qualifications, so they can develop and actively engage in a democratic society. Our school must be a safe and friendly place for everybody. That is fundamental for learning and for personal development. We want to encourage the childrens personal development, independence and initiative. 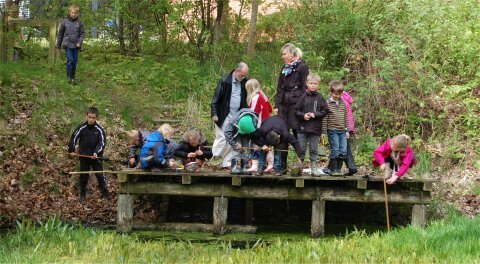 It is important, that the children at Stjærskolen feel that they are good at something. That they matter, and that they are able to learn something. A stable and socially balanced learning environment for children, will prodvide the best results. Therefore - we take great effort in creating a class and school environment, where the meeting between children and adults is characterized by collaboration. We constantly discuss what good and relevant education is - how children learn, how we communicate, how we can collaborate cross curricular and project-oriented, etc. These values have been the guidelines of our work for as long as the school has existed. They form the basis for our conduct within the school - in lessons, during breaks, in conversations, in gatherings and in meetings. "We all must learn as much as possible - even though we are not alike - and we must help each other to reach the goal"